Peel the parsnips and cut into wedges. Place in a baking tray with the seasoning, thyme and oil. Roast in the oven for 45 minutes until soft and caramelised on the edges. Pour on the honey, making sure all of the parsnips are coated and then return to the oven for 5 minutes. Peel the carrots and celeriac and cut into small dice. Peel and finely dice the garlic. Cut the cabbage in half, remove the tough centre and then finely slice. Pick the leaves from the sprigs of thyme. Pick the leaves from the parsley and roughly chop. Heat a saucepan and add the butter. Next, add the carrot and celeriac and cook until soft. Add the garlic, cabbage, thyme leaves and seasoning and cook for a further minute. Pour in the white wine, cover with a lid and cook for about five minutes over a high heat until soft. Check the seasoning and add the flat parsley. Peel and quarter the onion. Place this in a saucepan with the milk and spices. Bring to the boil and then leave to cool and allow the flavours to infuse into the milk. Remove the crusts from the bread and tear into chunks. Pass the milk through a sieve into another saucepan and warm gently. Add the bread and stir until the sauce is smooth. Check the seasoning and grate in nutmeg to taste. Season the pheasant breasts with salt and heat a frying pan until hot. Add the oil and then roast the pheasant skin side down until the skin is golden brown. Transfer to the oven and cook for a further 6 -8 minutes until the meat is almost cooked. Remove from the oven and turn the pheasant breasts over in the pan to finish cooking the flesh side. For the beurre noisette: Heat the butter and salt in a saucepan and cook until the milk solids turn brown. Remove from the heat and pour into a bowl. To serve: Fill a stainless steel ring with the cabbage, place the pheasant on top. 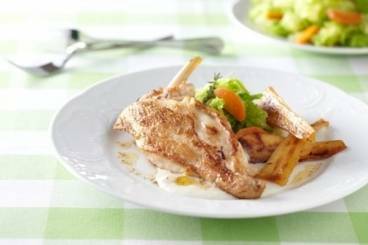 To the side of the cabbage pour on some bread sauce and carefully pile up the parsnips in the bread sauce. Finish the dish with the beurre noisette.